Yves Côté overcame a difficult past to help breathe new life into a 165-year-old church in the heart of Montreal’s Gay Village. Read his story as part of the CBC/Concordia series. Montreal Together is a series that explores how Montrealers come together in unusual and surprising ways. It a collaboration between the Department of Journalism at Concordia University and CBC Montreal. This story is the work of a team of student journalists. Yves Côté grew up in a small town in the Saguenay–Lac-Saint-Jean region, almost 500 kilometres northeast of Montreal. When he was 13, he told his local priest that he was a homosexual. "He thought that he could help change me," Côté said. "I didn't want to hear that. I decided that I would never go [to church] again." 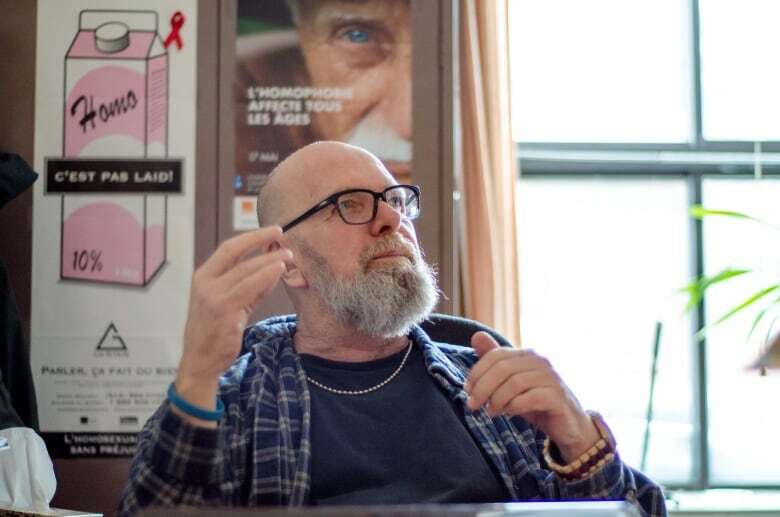 But Côté is now the parish care worker of Saint-Pierre-Apôtre, and he's a large reason why the 165-year-old Catholic church has managed to flourish in the heart of Montreal's Gay Village. Côté still remembers the day, back in 1995, when he heard the bells of Saint-Pierre-Apôtre as he finished a shift at a nearby restaurant. Following the sound, he arrived just in time for mass. 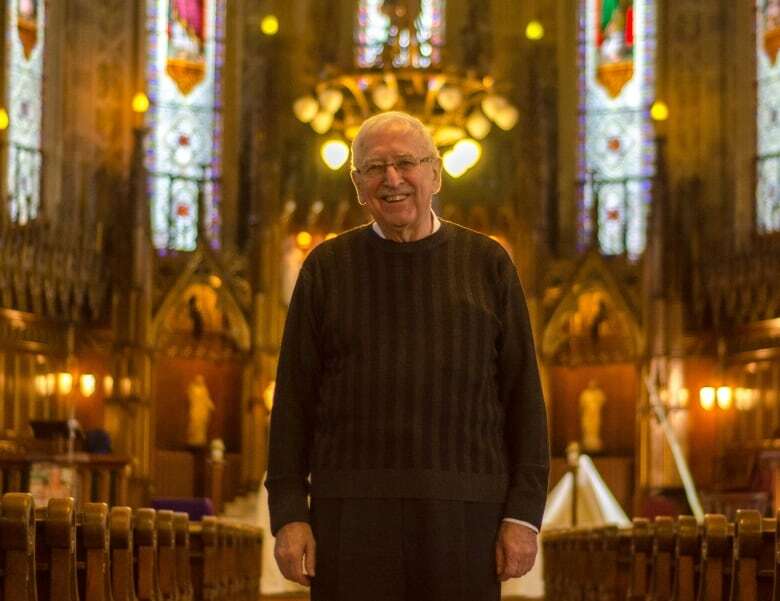 "I accept to be your pastor on the condition that we open the great doors of this church to everyone, no matter their sexual orientation or marital status," he remembers the priest, Claude Saint-Laurent, telling the congregation that day. "Whether you are a lesbian, homosexual, divorced, remarried, you are all welcome at the table of God." Tears streamed down Côté's face for the remainder of the mass. He felt a sense of belonging he hadn't felt in a long time. That night, he met with Saint-Laurent, telling him that he had 30 years of his life to share. After moving to Montreal in the 1980s, Côté found himself in a dark place. He struggled with drugs, alcohol and prostitution. Many of his problems, he believes, stemmed from a past denying his homosexuality. ​It was near midnight when he finished telling his life story to Saint-Laurent. He was surprised when the priest then promptly offered him a job. "I asked him, 'Are you drunk or crazy?'" Côté recalled, laughing. "I didn't understand why. [Saint-Laurent] said 'Because you'll never be able to judge anybody. Anything that people might confide in you, you'll have already lived it yourself." Côté is a rambunctious and spry 64 years old. He resembles a friendly giant with his tall frame. His face is accentuated by thick black-framed glasses and a full, grey beard always complemented by a smile. On a typical day, Côté can be found welcoming everyone who walks through the doors of Saint-Pierre-Apôtre. As the parish care worker, his role is to offer support, advice and guidance — always without judgment. He has heard the stories of people from all walks of life. While some struggle with drug addiction or debt, others simply need reassurance that God is truly with them, Côté said. In particular, Côté seeks to help individuals who identify as LGBT to deal with their sexual orientation and their religion. "For me, my family is the people that I meet every Sunday at Saint-Pierre-Apôtre," he said. "Whether it's the homeless person on the street who comes to my office or a teacher from a university, these are the people that help me grow every day." Together, Côté and Saint-Laurent took as their mission to make Saint-Pierre-Apôtre a welcoming space not just for Catholics, but for people of all religions and sexual orientations. They breathed new life into a church that first opened its doors in the mid-19th century, when the area was a working-class suburb of Montreal. Attendance at weekly mass nearly doubled thanks to their efforts. At a time when other churches were being forced to shut their doors, Saint-Pierre-Apôtre became increasingly popular. Even after Saint-Laurent left the parish (he died in 2015), his successors have maintained the church's culture of openness and its links to the neighbourhood. While many Catholic parishes in Montreal have maintained the Church's long-standing negative view of LGBT identities, there has been a shift in attitude since Francis became pope in 2013. "The official doctrine of the Catholic Church hasn't changed on gay marriage," said Alain Faubert, the vicar-general and auxiliary bishop for the Archdiocese of Montreal. "This being said, many things have changed when we look at people differently and how they live." The archdiocese doesn't get involved in the specifics of the pastoral approach taken at Saint-Pierre-Apôtre. But Faubert said the archdiocese nevertheless supports Côté's outreach initiatives with the LGBT community. There is perhaps no greater symbol of the relationship between the church and its neighbourhood than the Chapel of Hope. Inaugurated in 1996, when homosexuality and AIDS were still relatively taboo subjects within the Church, the chapel features dozens of plaques that commemorate victims of the disease. 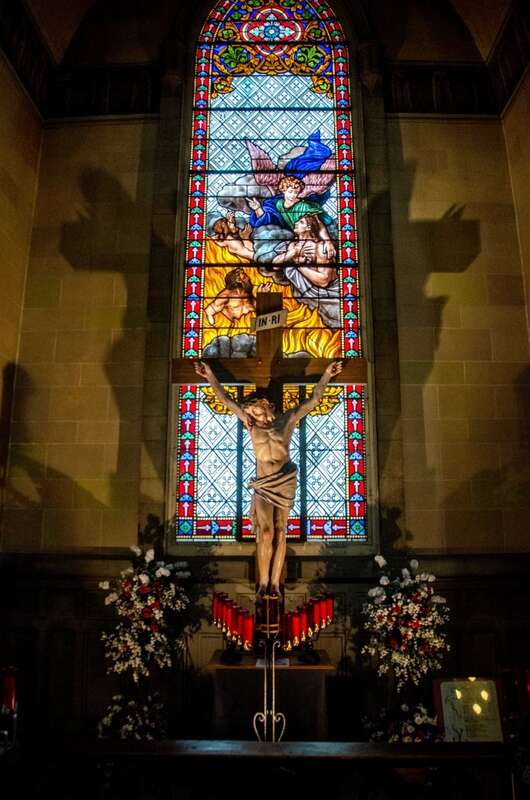 It is tucked within the northwest wall of the church: an ornate altar flanked by two stained-glass windows of angels. In the middle of the chapel is a gently trickling water fountain. Montreal is 375 years old, but how old are its buildings? Côté believes it is the only chapel of its kind in the world. "AIDS touches all people, all origins, no matter what," he said. "We've seen people of all religions gather in this chapel. We've had Jews; we've had Muslims ... We've had people from all over." 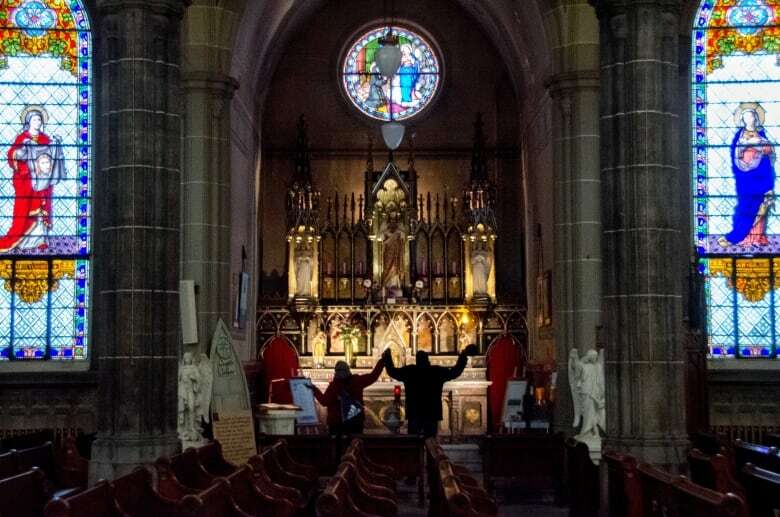 Côté emphasizes that Saint-Pierre-Apôtre is not just a church for the LGBT community. It is, rather, a safe space for anyone who feels excluded. "For me, this is how Jesus Christ would have wanted it," he said. Montreal Together is a collaboration between the Department of Journalism at Concordia University and CBC Montreal. Undergraduate students and graduate-diploma students in a multimedia course found and produced original stories about different Montreal communities. Working in small teams, they spent the winter semester developing their stories in text, audio, video, photography, infographics and maps.